When I discovered book and screenplay author/adventurer EJ Cedric’s exciting new project; a comic named “The Dying Breed” , I was intrigued and wanted to learn more about this personal story. Eric ‘EJ’ Cedric was born in the Adirondack Mountains of Northern New York State. Growing up in a small and isolated mountain town of 80 people brewed the love of the wilds and a passion for adventure. As a kid growing up in the sticks, EJ found love of all things comics and fantasy to help with the long, dark winters of the north. His family moved to a bedroom community of Syracuse, NY where his father had taken a professor position at the University. After finishing high school Cedric attended Syracuse University on scholarship. After tiring of the east and school he found himself living in Alaska, his home of almost 16 years. There he worked as a professional wilderness guide, leading rafting, kayaking, trekking, skiing and mountaineering trips into the wilderness of Alaska and the Yukon Territory. In addition, he led trips up Denali for several seasons as well as mountaineering trips up Elbrus in Russia and two seasons spent mountaineering in the Himalayas. During winters he grew his skills as a writer, successfully placing narratives of his adventures in many national magazines. Tiring of the winters in Alaska and ready to grow, he moved to Malibu where he honed his craft as a writer and made a segue into the entertainment industry. He has worked as a consultant on several TV shows, providing his wilderness, Search and Rescue and backcountry expertise. Cedric has worked as writer on serial TV dramas and a screenplay for a major super hero property. He has adapted his first book, “North by Southeast” into a screenplay. The story is based on his experiences living in a small Yupik Eskimo village along the frozen Bering Sea, where he worked as a dog-sledding guide. I recently had a chance to talk with EJ about his work, and about how life and art often imitate each other. At Stake Magazine (DT): Can you tell us a little about moving to Alaska and your life there, and how writing became a part of it? EJ: My Alaska move was purely serendipitous. I was 21 years old and floundering with being a clueless kid. After a few dumb life choices, I found myself living back at home, and one day I just happened to see this cool looking copy of ‘Outside” Magazine at a local drug store. I bought it and that night I read it cover to cover, and in the back there was a classified ad that was advertising a hotel chain was looking for summer help at one of their tourist hotels. So, I spruced up an unglamorous resume, faxed it up, then proceeded to call them every day until I wore them down to offering me a job. The job was folding sheets in the laundry room! But, that was how I got to Alaska, and I remember that from the very first minute of taking the Alaska State Ferry through the inside passage that I was never going to leave. The next season I was hired to be a glacier guide for a helicopter company, and that began my life of wilderness guiding. Wiring became an extension of that with daily journals kept of the days adventures. As I worked through the years (16 of them) as a guide, I was offered bigger and better expedition work, and through it all I would write of them, placing many articles in national magazines, including one in the magazine that launched my Alaska adventures and life. At Stake Magazine (DT): Malibu must have been quite the culture shock, did that environment change the way you approach writing? EJ: Malibu was a huge adjustment my first year there. I moved down to Malibu to try and build my writing career as well as to “follow a girl”. Of course that environment is full of entertainment insiders, and many of them became my friends, so I was able to convince them to hire me for consulting on wilderness issues with shows and screenplays, which then led to me writing on my own. This pushed me into a different level and I was able to use my connections to develop a career in a business that is way more difficult than climbing tall mountains or dog sledding in the arctic! The one thing I never faltered on, in fact, the California lifestyle brought it back out in me, was my love of comic books, superheroes and fantasy, which really provided a lot of inspiration for my work. At Stake Magazine (DT): You have been open about the fact that you are currently dealing with a major health issue. Can you give us an update and tell us how this is affecting your life and work? EJ: Yes, in December of last year I was taken to the Emergency Room where I was diagnosed with Multiple Sclerosis. But here’s the thing, 7-9 weeks prior to that and the onset of some very disturbing symptoms, I had found a tick embedded on me. I told the ER doctor this but was dismissed and ignored on that account, with the doctor doing one test of MRIs and simply said ‘MS’. This was like being hit in the head with a bat. It was a world shattering diagnosis, especially after having been such an active person my entire adult life. Well, through it all, I never felt confident in that diagnosis, so I did my own research because I sincerely suspected it was Lyme Disease, not MS. I FINALLY found what is referred to as a ‘Lyme Literate MD’ where it was pretty much confirmed, Lyme Disease that has advanced into the Central Nervous System. But most people are pretty uninformed about Lyme and how devastating it is, so it is a case now of ‘out of the frying pan and into the fire’. It has affected all aspects of my life, from my landing a dream job on a TV show where I had to step down simply because of the symptoms and how it affects me. That said, I refuse to stop writing, working and creating because that is not just what I do anymore, it is part of who I am. At Stake Magazine (DT): You have written books, screenplays; what made you decide to pursue comics? How has writing for comics differed in writing for the screen? EJ: Writing for comics and graphic novels is very much like writing a screenplay or a TV script. They are all forms of ‘visual writing’. A comic script is a little less formal than TV or features, but it is still a ‘blueprint’ that is being written for the artist to use to bring the vision in the mind to the page. One thing I love about writing in the comics world is the level of collaboration between the artist and myself. When I see my words turned into the illustrations, it is magic. Then when the lettering is added into the pages, it is much akin to seeing my screenplay or script being made into a show or film. Magic! Pure, unadulterated magic! It is work, though, but ‘great work if you can get it’! At Stake Magazine (DT): With your new comic “The Dying Breed” in the works, can you tell us a bit more about the plot and how you came to it? EJ: There is a huge irony with The Dying Breed and how it came to be. After speaking with a manager type and some colleagues, I began thinking of a new project and landed on it being a Graphic novel, which then turned into a full comics series. The Dying Breed is a team of five individuals who live what would be considered ‘dying breed lifestyles’. 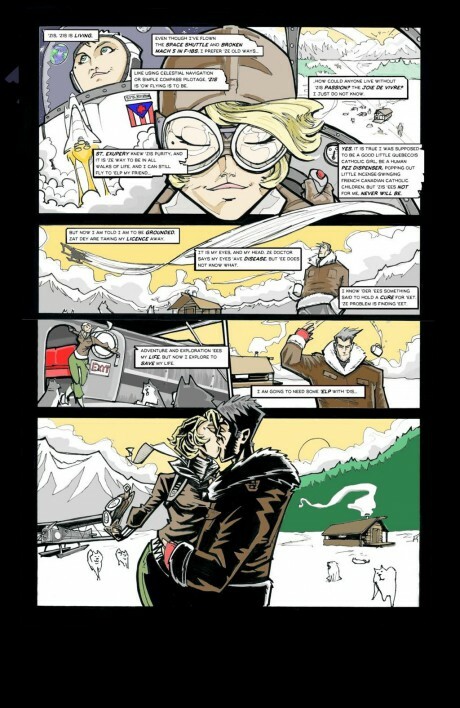 These include Denali Jax an Alaskan homesteader; Fennec Sands, a modern day Indiana Jones who goes on her treasure hunts in her vintage Dehavilland Beaver aircraft; Joan Cypher, a woman who bucks the racist odds to go on and achieve three PhDs from Standford, only to have to go on the run from an oligarch type corporation; Machias St. Joh, a true old school mariner who lives along the Bay of Fundy; and Einer-Nicolai-Olyenin-Ragnarson aka ‘Sonny’, a cowboy in North Dakota, born of Icelandic, Mongolian and Cossack heritage. As the story progresses, it is learned that all five have terminal and mysterious diseases that brings them all together. They realize the source of their illnesses comes from the pollution and destruction of the environment from the New Day Corporation, run by The Brothers, Mitch and Orrin VanBeck. These are heroes who are out of the norm, all with specific skills that help each other, and Joan Cypher discovers that each one of them has a gene that can help on of the others, at least in symptom relief, tying them together. The irony was I came up with this story about six months prior to my trip to the ER and my diagnosis! At Stake Magazine (DT): It seems like your time as a professional adventure-haver has been a major influence on your writing. The characters in The Dying Breed have some similarities in their backgrounds to yours. Can you tell us about how your experiences have influenced your writing? EJ: Oh absolutely. Many of my life experiences are called on in the creation of these characters. Denali Jax aka The Alaskan Homesteader was born out of my time spent in Alaska. Fennec Sands aka The Aviator was created out of my passion for aviation (prior to my diagnosis, flying was my big passion and love! I have been grounded since the diagnosis, but there is hope of flying again once I push the Lyme Disease into remission). Machias St. John was created based on my time spent adventuring and working in Newfoundland and seeing how the Grand Banks got destroyed by industrial trawlers and over-fishing. Joan Cypher was created based on my love of science and investigations and to show the world women and people of any race can get into this field. Sonny was created out of my love of the American and Canadian west, and how I needed a character to reflect the devastation currently taking place in North Dakota and other parts through oil pumping and fracking. At Stake Magazine (DT): Are there any other comic book authors or series that have inspired you? EJ: I hate to dip into a tired cliche, but the master himself, Stan Lee is a true role model for my work. The Generalissimo is the MAN! At Stake Magazine (DT): I have seen some work-in-progress pages from The Dying Breed on your Kickstarter page and twitter. Can you tell us about the process of choosing and working with your artist, Rich Wojcicki, how it fits into your vision for The Dying Breed and how the work is progressing? EJ: When it comes to ‘choosing’ an artist to work with for a project such as The Dying Breed it is like casting for a TV or movie role. There is no lack of awesome and tremendously talented people out there, but it comes down to ‘fit’ and who can sort of ‘extract’ the vision in my head to the page, like an actor does with a character for TV or movies. I found my artist through a connection I made in New York CIty at Forbidden Planet, a comic book shop in Greenwich Village. The work, just like in Hollywood, is progressing slower than originally anticipated, but that is because my artist and myself are perfectionists, believe in this story and are making sure we make one of the best new comics to hit the market in years! At Stake Magazine (DT): I’m sure you have your hands full working on this project, but is there anything else you are working on that you can tell us about? EJ: Sure. I am working on a series with a producer friend of mine that deals with the increasing crises of water and drought. The series is in development right now, but it deals with ‘How far would you go to ensure your family’s survival in the event of water being toxic or truly scarce’. I am also working on a TV series set in a small cruise ship port in southeast Alaska called ‘Port City’. This series follows an Environmental Officer for the State of Alaska as he investigates an illegal sewage and waste water dumping from a cruise ship and how if affects the region, both environmentally and economically. The show has an element of ‘organized crime’ as it really exists in a seemingly benign region and industry of the tourism industry in Alaska. Wherever you have millions of dollars being pumped into a small community, there will be extortion, corruption, and eventually violence and cover ups. Many thanks to Eric, for taking the time to answer our questions. We wish him luck and good health and we are looking forward to this project and many more to come. Duncan Trudeau is a musician and lover of comics, games and nerdy stuff. Expect more articles to come from him, about all these things.